Published April 16, 2018 By Anna T. This post may contain affiliate links. Regardless, I only recommend sites I've researched and/or used and trust. Are you someone who enjoys taking paid surveys, but you really don't feel that they pay enough to be worth the time? If so, then you may want to think about participating in some focus groups instead. These are similar to paid surveys you may have taken, but they are usually a lot more in-depth and, most importantly, they pay a ton more money. If you're familiar with paid surveys, then you already know that in most cases, you shouldn't expect more than a few bucks for your time. But with focus groups, you can sometimes earn anywhere from $50 to $100+ for your participation! The exact amount you'll earn will usually depend on the length of the focus group. Are focus groups more exclusive than paid surveys? Yes. Lots of times the market research company conducting the focus group will have a very specific demographic they need — even more specific than what you'll find with paid surveys. And this makes sense. If they're going to pay out the big bucks, they need to know they're getting opinions from the right people. 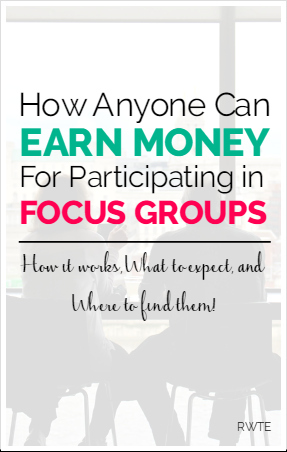 Can you do focus groups online just like paid surveys? Sometimes this is possible via chat. But not all the time — in fact, a majority of focus groups require either in-person or telephone participation. How does an in-person focus group work? Obviously this will vary a little depending on the company, but if you're asked to participate in an in-person focus group, you'll most likely join a group of other people for a round-table discussion at a location in your local area. There will be a moderator who will ask you very specific questions about the product or service they need feedback on. At the end of the discussion, you will be awarded the amount you were promised as thanks for your participation. How can you tell if a focus group invitation is legitimate? I'm going to give you a list at the end of this post of some legitimate companies that regularly conduct focus groups. But, if you decide to do some searching on your own via Craigslist or any other site, do your homework before giving any info. There are scammers that try to collect sensitive information from people by pretending they have a high-dollar focus group you can participate in. So find out who the company is offering the focus group first, then confirm that they are in fact doing the focus group you found the ad for, and try to sign up directly through them if it's possible. Is it hard to find local focus groups? Market research companies generally have focus groups going on all over at different times. And even if a focus group isn't being held inside your town, a little bit of a road trip might be worth it if the compensation is high enough. The best way to know when focus groups are being held in or near your local area is to register yourself with several different companies that conduct focus groups, search Craigslist (using CAUTION — never meet anyone in person that you don't know unless you can 100 percent confirm it's a reputable company that placed the ad), and via a site I discovered a little while back called Find Focus Groups. This is like a job board just for focus groups. First off, some companies will only let you participate in one or two of their focus groups per year, regardless of how many they have open. This is why it's important to be registered with more than one company if you want to be able to do these regularly. Second, this definitely won't be dependable income since you never know how often you'll get to do it. So just be glad to get to participate when you can and enjoy whatever your incentive is. Third, if you live in a rural area, you may not be able to participate as often. As mentioned above, if the compensation is enough, you may find it worth driving to participate. And sometimes you may luck out and find an online or telephone focus group you qualify for. What are some legitimate companies that occasionally need focus group participants? Here is the list I promised of reputable companies you may want to register with. If there is a focus group that they think you'd be a fit for, they'll let you know if you're registered. Keep in mind that you'll have to be “screened” first before being allowed to participate. This screening may involve answering some short survey questions online or via a brief telephone interview. Note that some of these are location specific, but they still may have the occasional focus group that can be done online or over the phone where your location doesn't matter. Metroline – For Canadians and possibly US. And then a few years ago I got a phone call from 20|20 Research — a very reputable company that does focus groups and online research studies that pay top dollar — and answered screening questions for one of their upcoming focus groups. Unfortunately, I did not make the cut, but if I had, I would have gotten a $150 Visa gift card. Curious about other ways to earn money with your opinion? “Your Guide to Taking Paid Surveys For Extra Cash” is an e-book with seven years of my paid survey experience showing you why your opinion is needed, a great system to follow for taking surveys efficiently, how you earn money, and of course WHERE to earn money, inside 27 no-fluff pages! Go here to download at Amazon, or you can read it free with a Kindle Unlimited subscription. Post originally published on April 20, 2015. Updated and re-published on April 16, 2018. Does anyone have any advise on getting hired by Vocalabs? This is a great opportunity for simeine with telemarketing experience. I would love to work for them. I have met people from other Focus Groups that do this full time. They have it down to a science actually and make a ton of money. The tips and tricks work, but from what they told me you have to be “creative”. I do focus groups as much as I can, and one of my biggest ground rules is never give out any information that isn’t very obviously something they would need to decide whether or not I’m a good fit for their research (they might need my age, but they don’t need my social to see if I fit, that’s serious red flags). Another rule I have is make sure where they want to meet is public, or at least you have a clear exit strategy for getting out if you have to. And if you get somewhere and it feels suspicious, just don’t go. Thanks for the tips, Lisa! I’m glad you found some new companies to try out. Is any of the websites that has been provided above applicable to those outside the US? I listed one that’s open to Canada. I don’t think the rest are open outside the US, though. I didn’t find any that are open worldwide.